CuSat50 interconnect cables will shield out interference and add nothing of themselves to your music. 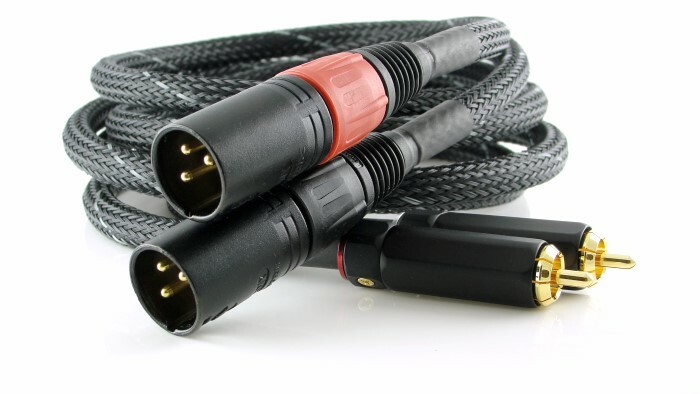 Available in stereo "dual-mono" phono cable pairs from 0.6m to 4.5m in length – a single cable is also offered which is suitable for 75&ohm; coaxial S/PDIF or video use. For the single version you can choose to add our professional BNC adapters at one or both ends as sometimes required for digital audio or video equipment. Tell us your exact requirements on this order form and we'll give you a quote. NB(1). The pattern in the braided jacket may vary between batches. NB(2). Single-ended means single phase, or in Europe: "asymmetrical". TRS Jack Plug looks like a stereo jack plug and is used for balanced audio on equipment which hasn't the space for an XLR connector. The conductive strength of the CuSat50 holds your equipment grounds tightly together and in doing so keeps ground-interference away. The importance of keeping impedance low between the grounds of interconnected equipment isn't widely understood in hi-fi. However, it is highly important in keeping hum levels as low as possible, and is widely known by true professionals in sound engineering. Think for a minute of the opposite: if impedance - which is the term for ac resistance - were allowed between equipment, their grounds (or zero volts) could "float" independantly of each other. Any mains-borne noise (hum) would create a voltage variation between the equipment grounds. The signal would therefore be modulated - the noise would encroach on your music. The CuSat50 uses ultra-low impedance shielding - the part of the cable responsible for keeping the grounds tethered - to bring that possibility to an absolute minimum. It's shielding comprises a tightly knit copper braid over, and in contact with, a copper foil which completely wraps around the inner signal cable. Copper is the second most conductive metal known behind silver, and its DC resistance is a mere 15 m&ohm;/m making the CuSat50 a great choice. The great thing about such a robust and highly conductive shield like the CuSat50's is its thorough protection from interference getting to the signal conductor inside. The hi-fi fashion over the last decade or so has been to "play around" with interconnects, often not using any shielding at all, but just having two wires - one for signal and one for return - which offers no protection at all. 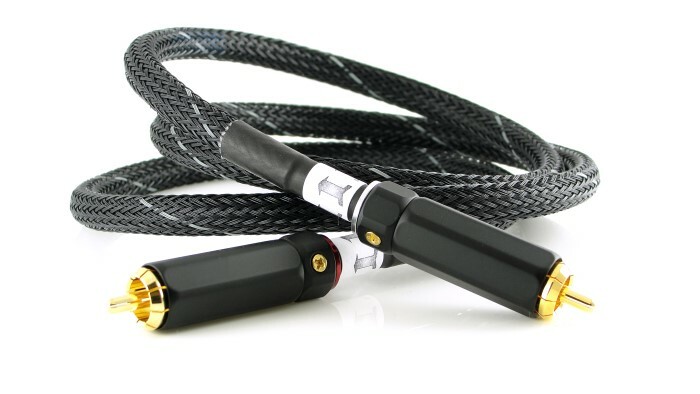 Another trend has been to tightly twist send and return wires, which may work to some extent in balanced audio, but again offers little protection in single-ended connections. The third trend we know has been to use twin cored shielded cable but only use the two wires for signal and return, leaving the shield unconnected. A shield without any signal return current running in it offers no protection! And then there's a variation on the last which connects the shield to ground at one end only, but that's only partially effective up to some cable-length dependant frequency, after which inteference is free to do its worst. ... in-band intermodulation products are inevitable when there are two or more frequencies (which there always are) and any non-linearities (which there always are). Interestingly, noise with fundamental frequencies that are outside the audio range ... can intermodulate with audio harmonic distortion products that are above the audio range, causing in-band noises to arise. The thing with intermodulation 'artefacts' is that they are completely alien to the original waveforms, so even small amounts may sound objectionable even though similar amounts of harmonic distortion products might sound acceptably low. The difference is you're getting more than you bargained for: other noises are adding to your music and that simply isn't high-fidelity. On top of that you risk real interference and if you weren't reading this you'd wonder what was causing it. The solution is simple: it's called CuSat50! The capacitance of the CuSat50 is only 55pf per metre which means it won't attenuate high frequencies even in longer lengths. Most preamps, or any other signal processing equipment outputting analogue audio, have output impedance which guards against instability from capacitive loading. But that output impedance (ac resistance) can form a low-pass filter with the cable capacitance, filtering the highest frequencies. Tubed equipment has the highest output impedances which limits its ability to drive long cables. And some products have little or no output impedance which can leave them prone to instability from too high a cable capacitance. If you're in any doubt at all and want to ensure the correct operation of your equipment you should make the CuSat50 your number one choice. With sprung split centre-pins and collet twist-locking barrel RCA/phono plugs - with gold plating - the CuSat50 make excellent 360° connections with all RCA/phono jacks. That's simply not the case with some "fashion" hi-fi RCA/phono plugs, especially those single contact plastic plugs some sellers rave about. The CuSat50 makes good and reliable 360° contact - plus - they're easier on you and your equipment by you not having to exert extreme force to push them on or pull them off. 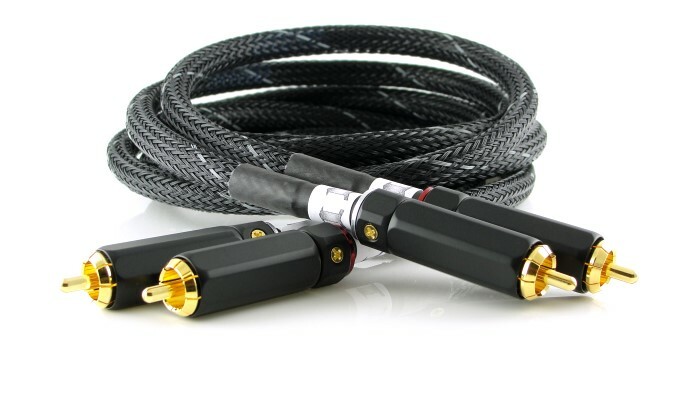 The CuSat50 can also be fitted with XLR and TRS connectors (stereo jack plugs used on balanced audio equipment) again using high quality connectors mainly from the world-renowned Neutrik. This cable is one of my favourite on the market and with the Grado headphones I have found it helps to smooth out the treble while still delivering bags of fine detail... John, who works with Graham, designs these cables for the enthusiast audio community, and his knowledge of cabling is second to none, the guy handled similar duties for the BBC for a good portion of his working life.
. . . after only a few minutes of listening i was able to detect a distinct improvement in overall sound, the adding of a power amp has made a dramatic difference in sound quality, and the cusats have help deliver the music from source to pre-amp/power and made a dramatic improvement. I can't tell you how it compares to anything else, but I can tell you I have the cusat50 connecting my reflex' M and Solo UL diamond edition and it sounds fantastic, I would not think anything could better it. But I know we all hear differently. But a big big vote from me.